Last night I found myself doing the most unpredictable thing. Stuffing humus, roasted beets, leftover cheese and olives into a wheat pita for dinner. It’s basically Halloween in an edible pouch. Old people food! The stuff I gagged at as a child. The big 3.0. is lingering and I can see it in my day-to-day actions. Who knew I would ever like beets? But, I must admit, 29-going-on-30 is very comfortable and roasted beets are surprisingly tasty. We made this beet salad last week at my Off Mendenhall Cooking Class and I didn’t get enough of it! So, I made it again (chickpeas and all) this weekend for friends. My most creative and charming pals, Larry and Bruce, were in town from LA and it was most appropriate to feed them a recipe from an award-winning Los Angeles chef! I’m a huge fan of the book Sunday Suppers at Lucques and tend to pull recipes from it for special occasions. 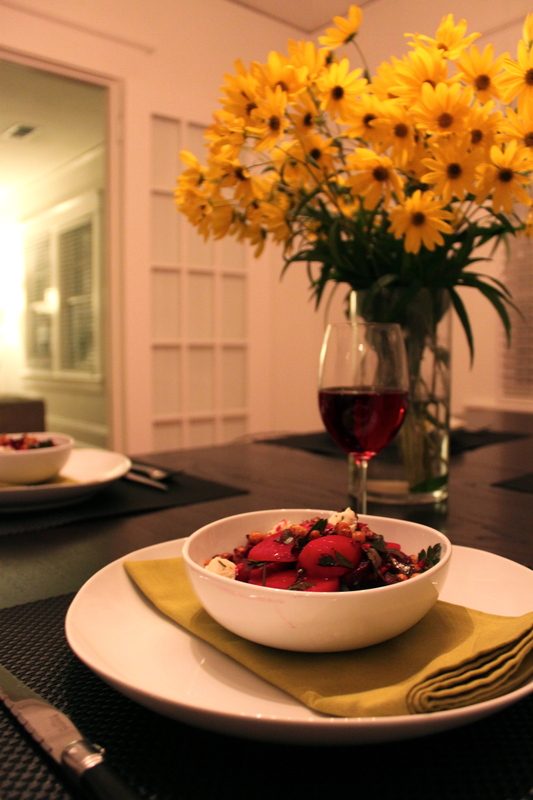 We enjoyed this beet salad along with a local gnocchi and spinach bake and pan roasted pork chops with cranberry sauce. It was really delicious. **With so many leftover chick peas, I threw them all into a food processor on Sunday and made humus! The cinnamon from the chickpea recipe makes the humus particularly interesting. I added plenty of tahini, hot sauce and lemon juice to the mix too. This recipe is a labor of love. But, let me tell you – the smell of cinnamon, chilies and onions on the stove during a cold Fall Saturday morning – incredibly comforting. Make the time for this recipe – it is totally worth it. Wash beets and wrap individually in foil. Roast about an hour or til tender when pierced. Allow to cool and peel by gently rubbing skin which will release it. Slice beets into wedges and place in a large bowl. In another bowl, whisk together cumin seeds, salt, vinegar, lemon juice and olive oil. Taste for seasoning. In a small saute plan, add a shallow layer of olive oil. Heat until oil very hot. Add drained chickpeas and fry them for 4-8 minutes, shaking the pan often, til they’re a little browned and crispy. Drain on paper towels and season with a little salt and pepper. Add shallots to the beets, season with a little salt and pepper, and gently toss with vinaigrette. Toss in parsley. Top with crumbled blue cheese and chickpeas. Enjoy warm or at room temperature! Heat a medium pan over high heat for 2 minutes. Heat olive oil to medium heat and then add onion, garlic, chile, thyme and bay leaf. Cook until the onion wilts then add chickpeas (with water! ), paprika, cayenne and cinnamon stick. Stir for a few minutes. Cover with water by 3 inches, and bring to a boil. Turn heat to low and simmer for about an hour. Test the chickpeas to make sure they are tender. Then add salt to taste – it will be more than you think. ** Don’t salt the chick peas before this process or they will turn to mush! When tender and seasoned well, allow to cool. Look at those amazing flowers!